CHRISTMAS TIME IS HERE!!!!!!!! And in our house, there is a lot of happiness and excitement! Cannon and Townsend have been loving every minute of the last month! From picking out and decorating our Christmas tree (They call it a “Deck The Halls Tree”), to learning all the characters in our manger scene, enjoying lights on people’s houses, visiting Santa at the mall, and watching lots of fun Christmas movies……it has truly been a blast! 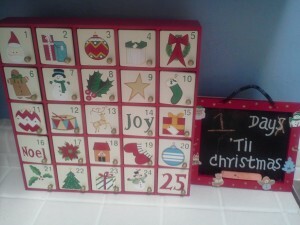 With Cannon’s Hyperlexia (intense fasination with letters and numbers), he also has been extra thrilled to count down the days till Christmas on our advent calendar and then write down the number of days left on a special chalkboard. I mean THRILLED! He wakes up early and its the first words out of his mouth…….”Count days? !” It has done my heart good to see his joy for the season! We have also been talking to them both like crazy and reminding them that Christmas is ALL about Jesus. 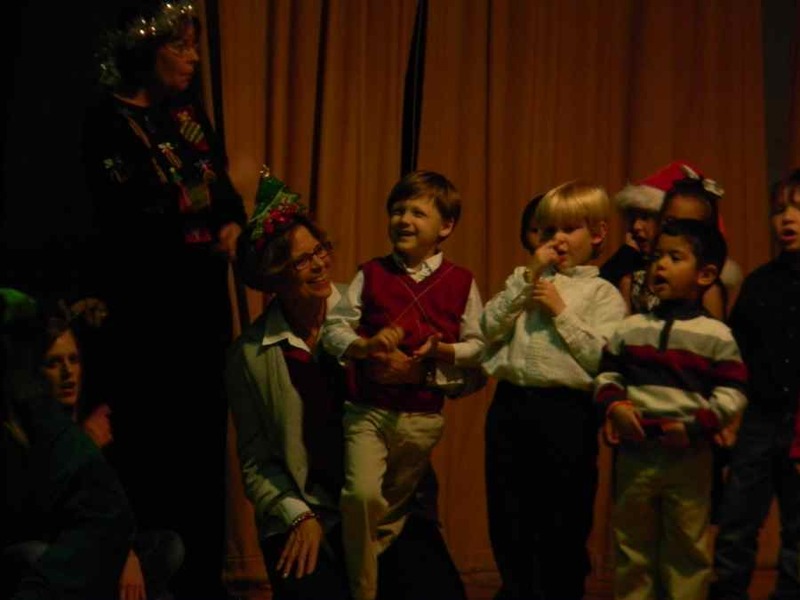 We ask them often…..”What is Christmas?” And they say with huge smiles and very loud, boisterous voices…….”Jesus’ Birthday!” We have told them about and read them the story of Christmas so much that Townsend can retell it in his own adorable little way. And if we are doing the retelling, they both can fill in words and finish our sentences. Makes a Momma proud! Cannon has also been particularly obsessed with all Christmas carols. Every last verse of each one, too! If you leave out a word or skip a verse…….he will quickly correct you. It is precious! I love my boys so much! 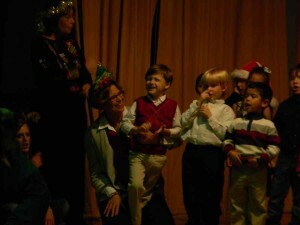 A week ago, Cannon performed in his preschool’s Christmas production. Last year’s event was a disaster of epic proportions. Not kidding! Let me explain. As we walked towards the school’s gym (site of the performance), he began screaming “No, no, no!” When we entered the gymnasium, he cut his legs out from under him and laid in the floor screaming. When I finally got him up, he took off up the bleachers. His teacher made it clear that we were sitting in chairs on the gym floor and no one was to be on the bleachers. Well, Cannon could have cared less. It was as if his body was magnetized to them. His aide and I finally pried him off of them and got him up on stage where he screamed nonstop until I embarrassingly snuck up to the stage with a snack bar for his aide to bribe him with. He stayed on stage long enough to inhale the bar and then began a series of 3 sprints off stage. Finally, we gave up and I took him out into the hall where he screamed and rolled around the hall for the rest of the event. It was one of the worst public experiences we have had with Cannon. So, you can imagine that we were not super excited for this year’s go round. But we knew he needed to do it and that there was definite potential for improvement. I mean, how could it get worse, right?! There was an intense effort by his teacher and aide over the last year to acclumate him to the gym and all its weird sounds, vibrations, lights, and smells. 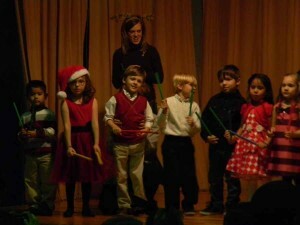 Regular trips have been taken to this building that the preschool never enters except for such events. We just prayed the effort to help him cope with his sensory issues in this particular environment would produce results. Well, this year was much different! Thank the Lord! It began the same though so our nerves were frazzled at first. He yelled “No!” as we walked up to the school, screamed once we entered, and dropped my hand and ran up the bleachers immediately. His aide told me as we extracted him from them that it was going to be better and not to worry. I was hopeful but not so sure! Well, the rest of the event went about as well as we could possibly have expected from Cannon. The preschool sang 2 songs, then were joined by the Kindergarten for 2 more, exited the stage for 3 and rejoined them for the last song. Cannon stood with his aide supporting his waist constantly for each song, played the sticks and shook jingle bells at the appropriate times, and didn’t yell or scream at all. I even saw him singing some! He does it at home all the time but rarely with a group. I was so so stinkin proud!!!!!! We are perfectly aware that on any given day, he could have the same problems as last year but choose to rejoice in the improvement rather than the possibilities! Go Cannon! Well friends, tonight is Christmas Eve and the excitement is definitely at an all-time high around here! We are spending the day making cookies for Santa, going to church, and coming home to follow tradition and open one present each tonight. Then off to bed for the boys and up early tomorrow I am sure! I can’t wait for them to see what is in store! I wanted to take this opportunity to say Merry Christmas to each of you! And wish ya’ll a meaningful, inspirational, and beautiful few days reflecting, rejoicing, and praising God for his incredible gift to all the Earth. His incomparable son, Jesus! It is not just a nice story……..it is the only thing that is truly REAL. I leave you with videos of my 2 favorite Christmas songs. “O Holy Night” and “Mary, Did You Know?” Each one is so powerful and the words allow you to really “be there.” I mean to think about how “that night” truly went down. The intense need for a Savior fullfilled, angels come down from the heavens singing, the whole Earth rejoicing! TOTALLY INCREDIBLE! And to think about what Mary’s journey was like! From young, ordinary, unmarried woman to the mother of God’s son, Jesus! And to then think some more about whether she could have ever imagined the things her son would accomplish and his impact on this world! This song nails it on the head! My favorite line is “This baby you’ve delivered will soon deliver you.” Wow! Please enjoy, meditate on the words and experiences, and take in like air the beauty of God’s gift to us! And accept this wish of a very MERRY CHRISTMAS from my family to yours!!!!!!!!!! Today is an anniversary or sorts. And not one I remember fondly…….have pictures of, mementos, or other positive memories. It was a day that ensured things would always be complicated, shook our family to the core, and changed our lives forever. It was the day that a neurologist we had never met before sat across from Mark and I and spoke one word in reference to our sweet son. AUTISM. And to this day I still stand in awe of the difference one word can make. The power of one word on people’s opinions, expectations, and biases towards a child. The impact that one word can have on a future. And the complexities that reside in that one word. We went to the Neurologist that day because our Pediatrician was concerned with how quickly Cannon had gone from totally fine to a completely different person. It was literally in 2-3 months in 2009. So, she recommended we see both a Neurologist and Developmental Pediatrician for evaluation. When I made the appointments it just happened that we could get the neuro one first. I remember sitting in that office wondering what in the world we were doing there. I could understand going to the other doc……but not this one. We did not suspect neurological problems and had no idea she had the ability to diagnose us with anything else. There were some foam letters in the exam room that Cannon fixated on and never parted from. Arranging them in order and screaming if he couldn’t find one or if we tried to get him to play with something else. A month prior, there was no fixation, no obsession, no repetition. The downturn was just so fast. When the doctor entered she surveyed the paperwork we had filled out and asked us more questions……all while watching Cannon play. She eventually did try to talk to him, do an exam, and perform some assessments. Not to much avail. At the end of the appointment, she looked at us with assurance and said words I won’t ever forget. “Based upon my evaluation and the information you have provided, I feel confident diagnosing Cannon with Autism.” The sting of that word hurt more than I can possibly express. I had to hold myself back from screaming “NO!” I felt like I was gasping for air. Tears surged to the edge of my eyelids and streamed down my face. I couldn’t speak. I just couldn’t. But I wanted to. I wanted to tell her he was just having a bad day, didn’t sleep enough lately, or was just going through a bad phase. But the words she spoke, I knew deep down in my heart were now our reality. I wished with all my heart it wasn’t……but I knew it. 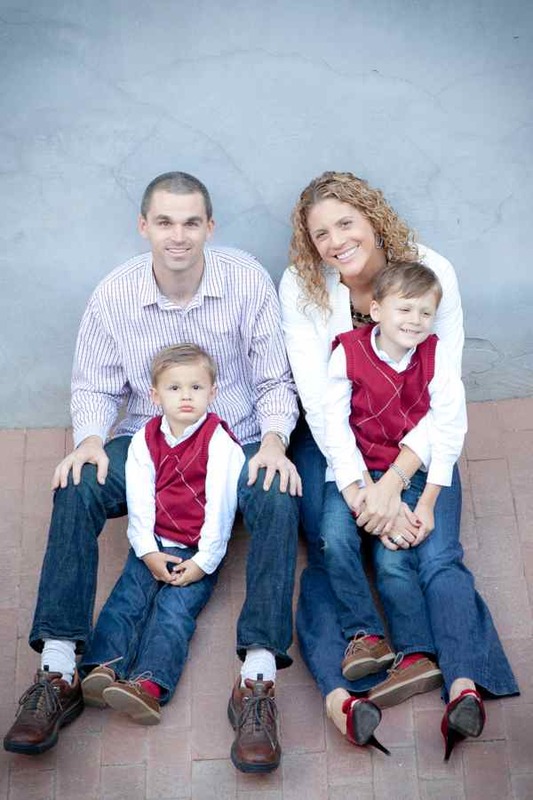 She encouraged us to see the Developmental Pediatrician for a specialized plan and further evaluation. She also wanted to get an EEG and MRI. We thought this was crazy but they did later, to our dismay, turn up the Focal Seizure Disorder. She also said one more thing that has stuck with me. She said, “He’s still the same little boy you brought in here today. That hasn’t changed.” To me she was saying, you don’t leave here with a different child. You still love him just the same. He still loves you just the same. The fundamentals of your relationship are the same. Even though EVERYTHING else is about to change. We walked in a daze to our car and strapped the boys into their car seats. I remember shutting the car door, turning my back to the window, and sobbing into my hands. Mark grabbed me and we just held each other crying. WE JUST COULDN’T BELIEVE IT!!!! We were not mentally prepared for this to happen that day. On the way home, I sent out a mass text. For the first time in my life…..I didn’t want to talk. I just needed time. To process this, to cry, and to grieve the life I had hoped of for my son. The text said something like “Cannon was officially diagnosed with Autism today. I am not ready to talk. Just need some time. Will let you know when I am. Love ya’ll!” I just didn’t want to answer questions or be pitied. To hear comments about how we will get through this, they might have known this ahead of time or we should have. I told Mark on the way home that I was going to give myself 2-3 days to cry about this and then it was time to start fighting. I have always been a planner and needed a time table. So that is exactly what I did. When my 3 days were up, I jumped online and signed up with Autism Speaks, got their 100 Day Kit (what you should do within the first 100 days of diagnosis) and began doing research to figure out what was next. On December 23, we saw the Developmental Pediatrician. His job is to diagnose, follow, and come up with the plan of attack. He concurred the diagnosis and prescribed 30 hours a week of Applied Behavior Analysis (ABA) therapy, 1 hour a week of Physical, Occupational, and Speech Therapy. He also wanted him in a developmental preschool as soon as he turned 3. He gave me books to read and websites to look at. A diet to follow and supplements to begin. A research study to get involved in. Training to take. A lab order for some basic tests and also specific genetic testing (Fragile X…..the one known link, to my knowledge, to Autism. He was negative for that one.). Also, he wanted me to see other specific doctors and therapists for further evaluations. When all was said and done, our 2 year old son had diagnoses of not just Autism but Hyperlexia, Focal Seizure Disorder, Severe Sensory Processing Disorder, Severe Expressive and Receptive Language Delay, Severe Fine Motor Delay, ADHD, and Chronic Gastrointestinal Impactions. That is what I meant when I referred earlier to the fact that Autism is so complex. There is so much more to and than just Autism. And there are so many other problems that kids like Cannon can have. Obsessive Compusive Disorder, Aggression, Sleep Dysfunction, and Pica to name a few. The disorder is a spectrum disorder. Where no 2 kids are alike. It is phenomenally complex. I would like to take the opportunity to educate you a little bit. Since this disorder is becoming so common……the odds are that if you don’t already, you are very likely to know someone soon enough who has this diagnosis or has a family member with one. I feel it is important that you know how you can best support someone going through what we did…..are. PLEASE listen carefully and know that this comes from my heart. I am not criticizing, judging, or preaching. Just simply sharing information that I have learned through unfortunate circumstances to be so. My best advice is to …… Just show the family love. Meals, cards, phone calls, thoughtful gestures, free babysitting, a listening ear, hugs, and most of all, prayers. Honestly that is the all! Please do me a favor and don’t say what one person said to me…..”Well, you had to have known.” Although I know that heart was pure……it was not supportive, helpful, productive, and frankly insults the person as a parent. I realize that in these kinds of situations…..you just feel like you need to say something…..to fill an awkward time slot…..but that and anything similar is so not it. It makes it far worse. I prayed and asked God why this was happening and I came to the realization that I was being taught not to rely on man. But on God for the strength and encouragment to endure. One friend did hit it out of the park, though. (Love you Karli!) 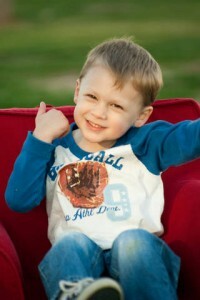 My biggest fear after Cannon’s diagnosis was that other parents would not let their kids play with him. Because he was different, they blamed us and/or thought we were bad parents, or thought some of his behaviors might rub off on their kids. And in a few cases…..my fears were realized. And it hurt……BAD. There are some people who stopped calling, coming by, or staying in touch completely from that day on. I beg you, if this ever happens to a friend of yours or even just someone you know…..please consider this an opportunity to carry out a great commandment. To “love your neighbor as yourself.” (Mark 12:31) They will become extraordinarily busy but please continue to communicate. Email, Facebook, a written note……anything. The isolation and loneliness that accompanies this diagnosis is so hard to endure. So very hard to endure. Every little effort by you means so much…..I assure you. But back to my one beautiful friend. She blessed me and my boys by coming over, bringing lunch, and her son for a playdate. She listened, gave me lots of hugs, played with both boys, and even did the dishes after. That gesture of kindness gave me so much comfort. I just needed to be loved, supported, and to know that Cannon would not become ostracized. She did exactly that! We had some photos taken of the boys soon after the diagnosis. A friend of mine (Thank you Susan!) was the photographer. One photo from that session has always stuck out to me. You have seen it if you have perused the website here but just incase……voila! I actually got emotional when I first saw it. And thanked my friend profusely. Why? Well, because we lost the Cannon we knew when Autism came into his life. The way he looked deeply into your eyes, his joy, and his constant smile were replaced with no eye contact, seemingly never ending frustrations, obsessive and nervous behaviors, and a smile that only made super brief and unpredictable appearances. Well, this one photo…….I feel like captured the old Cannon. And I love it! His old smile, his relaxed nature, joy, and playfulness. And those eyes! She really got a good look at them! I, personally, love looking into them so much……it was one of my focuses when I began this blog. To see, really see into his world and regain that relationship where he was comfortable looking into …… not past….. mine. I miss the old Cannon. So much! And this picture gives me hope and also a goal of what we are trying to get back. So this December 7th marks 2 years since that rotten day. That sad, sad day. We wish it had never happened to us. We wish Cannon did not have to endure this every second of every day for as long as God chooses him to be on this Earth but we know that same God has a plan for him. And like most plans for a life, you cannot see into the future. To see why this was necessary, to see what is in store, how he might affect others, or impact the world. You just can’t. You just have to have faith and trust that our Father knows what he is doing and doesn’t make mistakes. My senior quote in high school was …… “I don’t know what the future holds but I know who holds the future.” I rest in that. We will continue to fight every day for Cannon. To ensure he gets the best therapies, medical care, and help along the way. And to love him like crazy! Thank you friends! For being there for us, for loving us, praying for us, and following our journey. We thank our Heavenly Father for your role in our lives and pray blessings upon each of your families. Please enjoy this song as I sign off today. It has truly been an anthem of mine over the last year. I am trying so hard to do what the song says……to “praise Him in this storm.” And on the days when I feel strong……it reminds me to be thankful for that strength and pumps me up even more! The days that I feel weak……it reminds me God feels my pain, will NEVER leave me, and loves me completely. And to praise Him anyway! On the days in between…….it just encourages me to stay the course. To keep on praising Him with my whole heart! I really love what the lead singer says before he begins to sing. “I guess what God is showing me is that sometimes He calms the storms in our lives and sometimes He just rides them with us. But either way, Blessed be the name of the Lord.” Ahhhhh! Good stuff! Have a listen!